The topography in Tomohon is like a sandwich where the area is flanked by two mountains, which is Mount Lokon and Mount Mahawu; this makes this region seem so cool and refreshing. The nature is genuinely beautiful with tremendous panoramic mountains and hills. The flowers that flourished around this area make Tomohon predicated as the city of Thousand Flowers. One of the leading tourist destinations of this area is Lake Linow, a beautiful lake which showing the beauty of 3 colors lake. 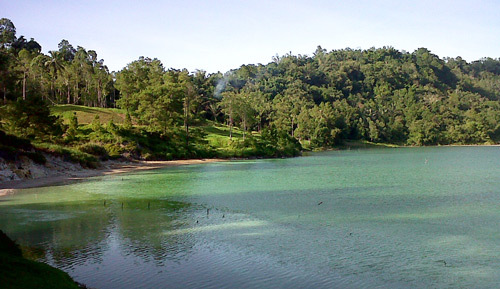 Located 30 km from Manado or take about 1 hour drive; Lake Linow is can be reached 3 km to the west of Tomohon. During the trip, we will serve by green landscape of hills that covered with large trees. Mount Lokon is still active and it also becomes one of stunning panorama that being presented here. Having almost perfect triangle shape, the mountain seemed to spoil the eye with green trees. After arriving in the lake, do not get confuse by the odor resembling rotten egg that will be smelled. The aroma comes from the smell of sulfur that is scattered around the lake. It said that this is residual sulfur from Mahawu eruption that happened hundreds of years ago. The word Linow is taken from the Minahasa that refer to Lilinowan which means the gathering place of water. In this lake, we can see the color of the water that can change the color to green, blue and amber. The change happens because the element of sulfur that buried in the lake as well as the refraction and reflection of sunlight which causes the color of the water in Lake Linow can change. Wandering the banks of the lake can also be one of activities that can be done in this lake. But better not to swim, because of the high sulfur content can make the body get injured. Visiting Lake Linow is affordable trip for we just have to spend Rp 25,000 to be able to enjoy the beauty of this lake. Interestingly, the visitors will also get a cup of tea or coffee. But if the cost is quite costly, we can go down a little bit to the tavern at the bottom, where we just have to pay Rp 5,000 and can instantly enjoy the beauty of Lake Linow from the shore. Visiting this lake will become a very pleasant experience. By staring at the natural beauty of the lake will bring tranquility in your mind and capturing good memories to be kept afterward.